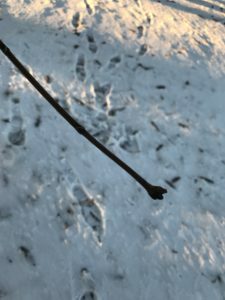 I have finally returned back to my site at Centennial Woods for the first time since the start of the new year. 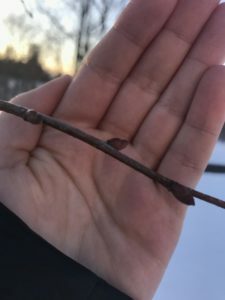 Since my visit in December, when the first snow hadn’t truly occurred, many phenological changes have occurred. Now, an inch of snow or so covers the ground and all of the vegetation is covered up. It is also much quieter this time than last, as the whole time I was here today I didn’t even hear a bird chirp once, or see anyone else out there. Also, the fallen log has been moved once again from its usual spot, and now lays closer to the large Eastern White Pine, a sign that humans had been here and moved it around. 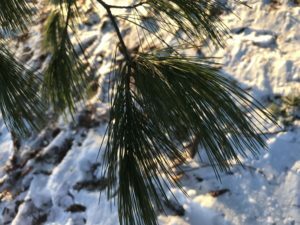 Despite these differences, one continuity from last time is that pine cones and needles still cover the ground, despite the snow, as shown above. 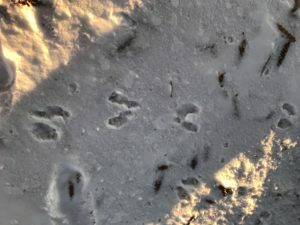 Because of the snow, I was able to see the tracks left by animals. 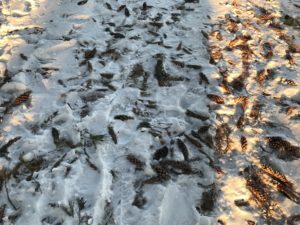 The main tracks in my site were from a squirrel, as they are the right size, being about 3 cms, all four tracks are together, they front and hind tracks are different sizes, and they were that of a galloper. 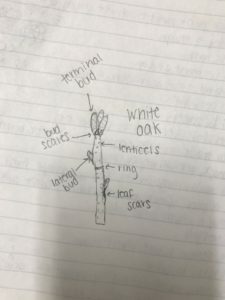 I also took note of the buds on the trees, and identified them as Red Maple, an Eastern White Pine, and a Sugar Maple, using both prior phenological knowledge and my Winter Twig Identification sheet.